How Much Useful Radiation Does the Sun Deliver? 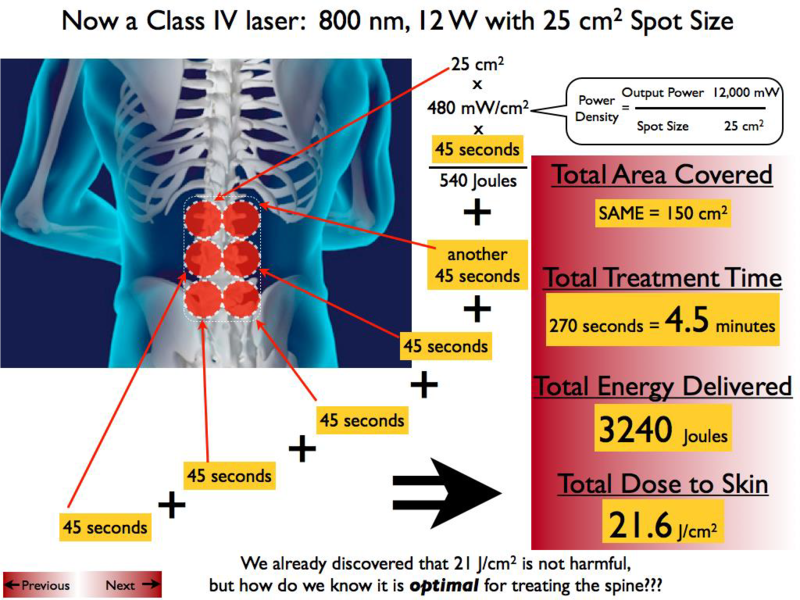 This paper from a K-laser employee discredits the Arndt-Schulz Law for laser therapy and shows the best way to calculate dosage at depth and treatment area.. It is important to understand the order of magnitudes involved when it comes to applications in radiation. Far too often do people present generalizations without at least a relative scale. Even when printing graphs of data, people neglect the axis-labels, whether it be through a lack of units or the superposition of two plots that have different units. As such, these graphs lead to inaccurate conclusions about the point attempting to be made. A prime example of such hand-waving arguments is the ubiquitous citation of the Arndt-Schulz law, which refers to “U” shaped dose response curves for external agents: below a threshold there is no effect, a small amount of something has small effect, a moderate amount has a large effect, and a large amount has either no effect or an adverse effect. This “law” was originally formulated in the world of pharmacology, has come in and out of favor several times, and now serves as one of the foundations of homeopathy. There is no doubt that there are issues relevant to laser therapy in which this idea applies; the creation of reactive oxygen species (ROS) or free-radicals is an obvious example. Radiation oncology takes special advantage of free-radicals as they are potent DNA breakers; in fact, the hydroxyl radical that comes as a by-product of ionized water accounts for about 2/3 of all radiation induced, mammalian DNA damage (1). In lower levels, however, ROS’s serve as cell-signal carriers as well as to induce an endogenous response that leads to an increased long-term defense capacity against exogenous radicals and other foreign toxins. But, it is crucial to remember that this is not a “law” at all, nor is it based on fundamental principles or cellular processes, and so to claim that more than X amount of radiation is inhibitory because the Arndt-Schultz law says so, is completely unfounded. Virtually all of the empirical investigations that attempt to narrow the optimal treatment parameters have been performed in vitro. These studies have the advantages that the majority of the parameters can be easily measured and well controlled, and many of the results of these experiments have indeed shown an optimal dose region for biostimulation above which inhibition takes place. There are, however, inherent limitations in extrapolating these results to conclusions on the effects in bulk tissue, as well as some fundamental shortcomings in the breadth of their investigations. 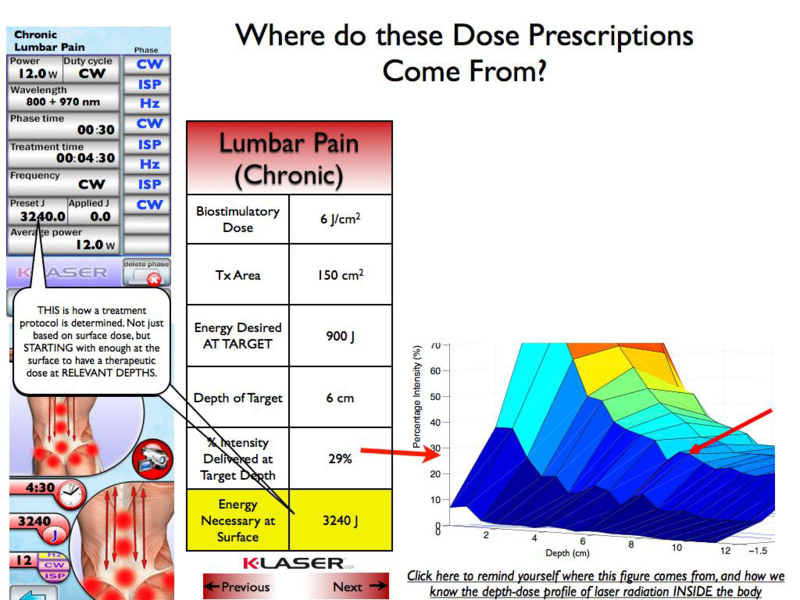 An obvious example is simply the range of doses used and the a prior assumption that there is only one peak in the biostimulatory spectrum. Tiina Karu, among others, has shown this to be an invalid assumption, and that for a given cell line, there may be several peaks of similar biostimulatory effect separated by several orders of magnitude of doses (2). So the “U” shaped dose response curve cited by a particular study may illustrate only one of the several potential peaks in a curve, whose full range has not been measured. To bring some perspective to the amount of radiation delivered during therapy and hopefully shed some light on the increasingly popular “overdosage” concerns, let us examine how much radiation we are exposed to when walking outside. Figure 1 shows the solar irradiance data recorded by National Renewable Energy Laboratory (3). Surprising to some is the fact that the majority of the radiation we experience from the sun is not in the UV or visible spectrum, but rather in the infrared range. How much though? Table 1 shows the integrated power densities for some relevant wavelength ranges as well as the resultant accumulated doses of each that we are exposed to per hour of sunshine. Recall that the Class III distinction for lasers includes average power outputs from 5 to 500 milliWatts, and also that this is not a power density, just an output power. Also realize that an Oreo cookie covers an area of about 25 cm2. So at the very top end of the Class III capability with this reasonable spot size estimate, the maximal power density deliverable is 20 mW/cm2. 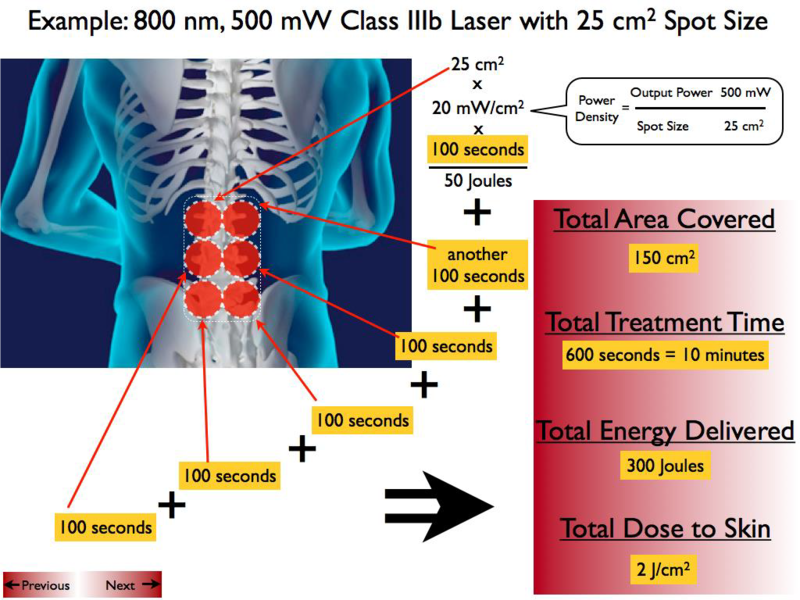 You can see from Table 1 that you are exposed to more than that amount of radiation (33 mW/cm2) in the “therapeutic window” (the region in the near infrared (NIR) between the peaks of melanin and water where the most penetration into the body occurs) from the sun than you are from a therapy session with one of these lasers. “But that is a pretty wide spectrum of wavelengths, what about a single wavelength laser?” you ask. Ok let’s examine, for example, an 800 nm therapy on a lower-lumbar ailment that is centered on the spine, spans 10 cm (~4 in) wide and 15 cm (~6 in) long, so an area of 150 cm2. Given the same power and spot size as before, segment the 150 cm2 lower back into six, equal 25 cm2 sections. If you were to spend 100 seconds on each segment, then in 10 minutes (600 seconds) you would have covered the entire area and delivered 300 Joules of energy evenly across this lower back region**. 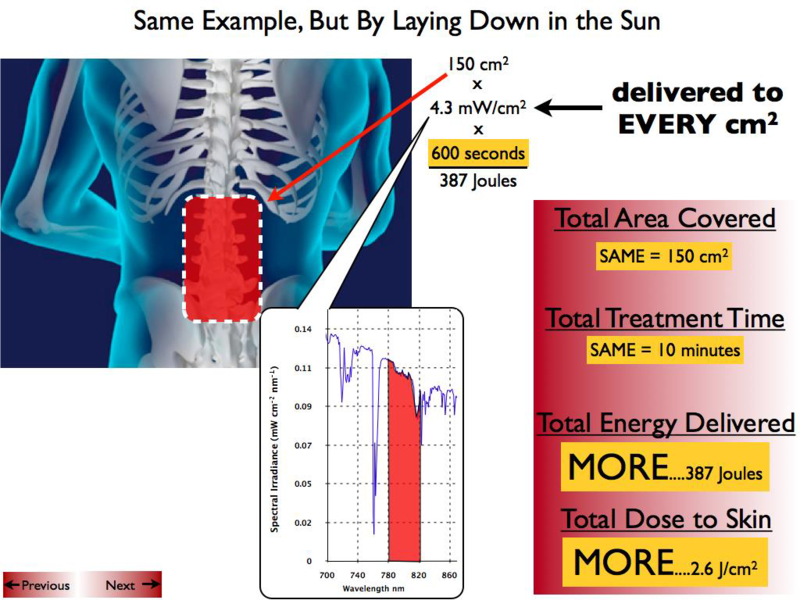 In that same ten minutes, in the same lower back region, and with radiation in the same wavelength range, the sun will have delivered 387 Joules of energy (4.3 mW/cm2 @800 nm x 150 cm2 x 600 seconds)!!! The sun delivers this power density to every centimeter regardless of the size of the treatment area simultaneously, whereas the laser is confined to its spot size, so increasing the spot size from this fixed-power-output laser would decrease the power density (not so with the sun, which delivers 127,000,000,000,000,000 Watts of power to the Earth’s surface). Yes, controlling electronics precisely enough to have clean, square- or triangular-waved pulses can be difficult and slightly expensive to manufacture and program. This capability is also very important since it has become quite clear to our industry that different conditions and tissue-types respond differently to different modulation frequencies during treatment (4). But at its very heart, this functionality can be accomplished inexpensively by using a $14 variable speed box fan with different size and shaped blades that chop the beam systematically. Granted, this is inconvenient, but it would be very difficult to justify paying several thousand dollars just for that feature, especially on a laser whose power density output is dwarfed by the solar irradiance on a sunny day. “So what is worth the money?” Class IV lasers, by definition, have power output above 500 milliWatts, and there are some on the market that span up to 60 Watts of average power. Some have fixed spot sizes, some variable, and the power density spans quite a large spectrum. A 12-Watt laser with the same Oreo cookie spot size delivers a power density of ~500 mW/cm2, a full 24 times greater than the most powerful Class IIIb laser, never-mind one where the spot size can be narrowed to the size of a nickel (area = 3.5 cm2, power density = 3,400 mW/cm2). Now there is of course a ceiling of power density above which thermal damage is possible (power densities above about 1,200,000 mW/cm2 are used for surgical applications) and so therefore there is a fundamental limit of the maximum power of a therapeutic laser (in fact, we have already reached that limit). But there is no ceiling of dose. Nonsense? 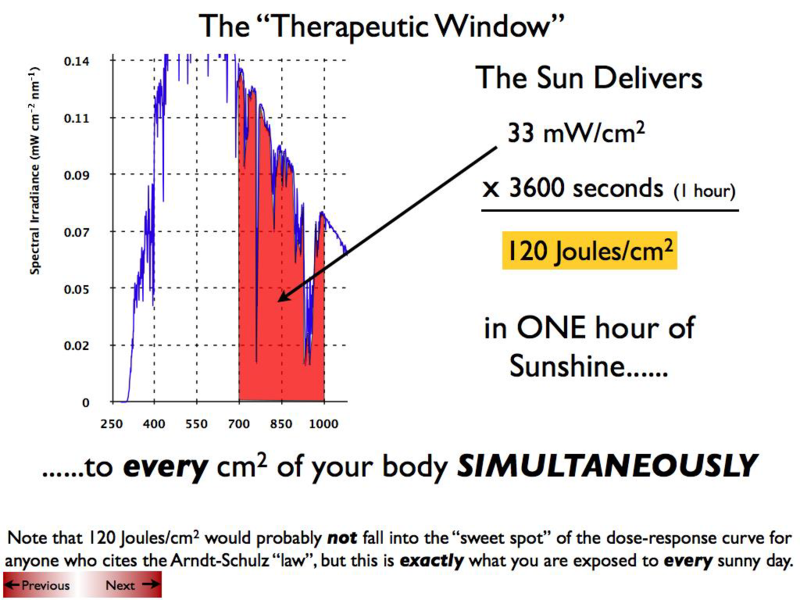 I’m sure a value of 120 J/cm2 (from Table 1) would not be in the “sweet spot” of a graph that someone who is quoting the Arndt-Schulz law would use, (in fact, it would most likely fall into the “Inhibitory” ditch) but that dose is literally just a walk in the park. 1) Hall, E., Giaccia, A. J., 2006. Radiobiology for the Radiologist, 6th Edition. Lippincott Williams and Wilkins. 2) Karu, T.I., Pyatibrat, L.V., and Ryabykh, T.P. 1997. Nonmonotonic Behavior of the Dose Dependence of the Radiation Effect on Cells In Vitro Exposed to Pulsed Laser Radiation at 820nm. Lasers Surg. Med. 21:485-492.